Looks good! 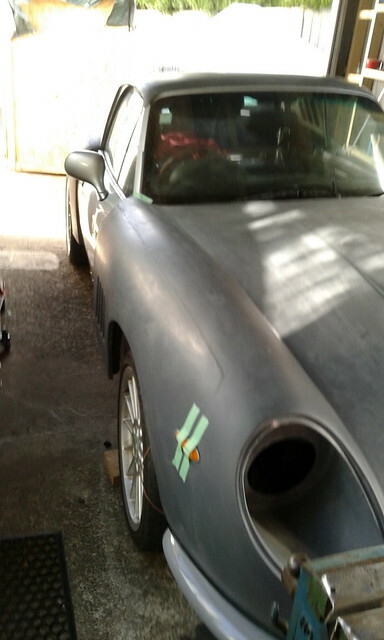 The front end moulding in one piece looks better than the split front like on Kidge's car. The frenched in side lights in the moulding also a big plus to get the right look. Are those the GRP quarter bumpers you have fitted ? Cheers guys, yup the grp quarters are what Chris/Dan did for me with the kit. Nicely done with their own integral bracket. 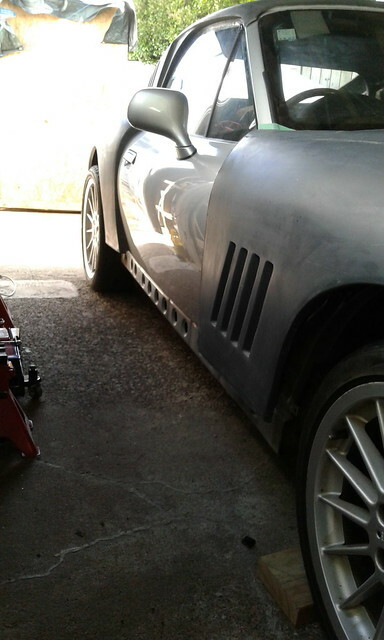 I will do a bit of reprofiling in a few areas, paint the underside etc and get them chrome vinyl wrapped. They should look pretty sharp then and able to be re-covered if they get chips/damage. Also really happy with the indicators/look just got to get them installed with better retention. Cheers. The following is the normal safety caveat - I am only disabling my SRS system as I am allowed to by LVV and the fact that new seatbelts are being fitted. 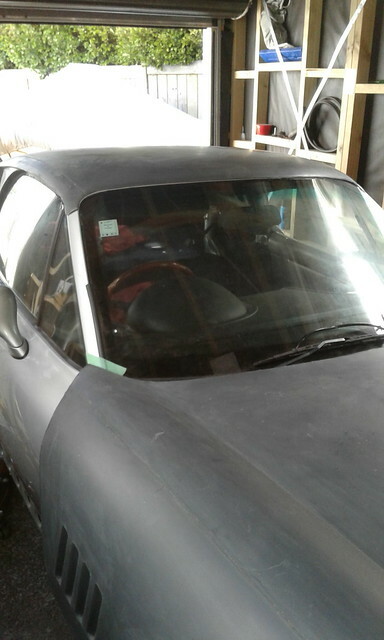 I am not condoning tampering or working on the SRS system for any purposes other than documenting what has been done on my car so my memory can be accessed down the track. 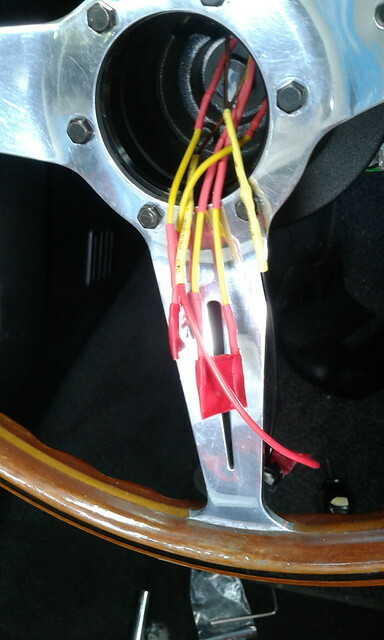 Passenger side occupancy sensor - 2x100 Ohm resistors and 1x 1N4004 diode in series (Silver diode band to blue seat control box unit lead) - Simulates someone sat in the seat which activates the Passenger airbag and stops a fault code for SBE01. This above info can help if you have a fault message and you are trying to identify if it is the loom or a component faulty. You will need a fault reset tool though as they stay "latched/hard locked in"
Also mocked up the R/H indicator tonight - see below. WelshKiwi – Looks like you are making good progress. I’m also sure that even seeing something as small as the side indicator in place helps with motivation. Good to see 'MY' bumpers being used, did Chris say that royalties would follow . . . The side repeaters look fine, I sealed them with some soft butyl and had enough bolt length to fit well. They are certainly an item of beauty. 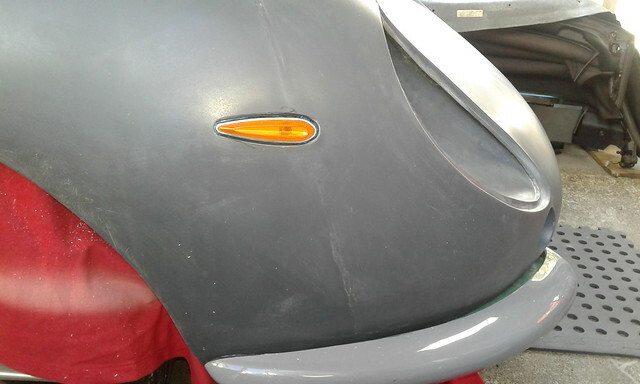 Is the panel base for the front indicators facing straight forward ? 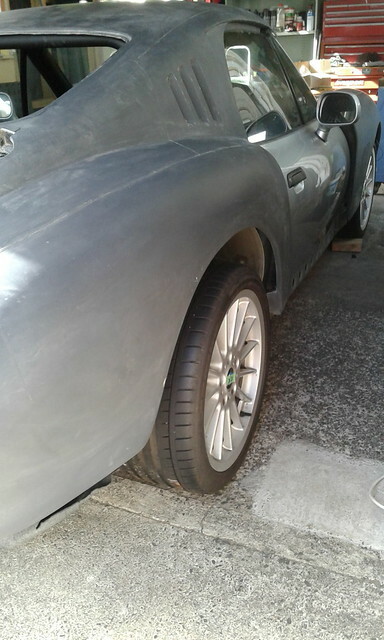 We fitted some uprated bonnet struts, but it is tricky with a lack of space. Really need even more force to hold the bonnet up. Lovely to witness your progress. 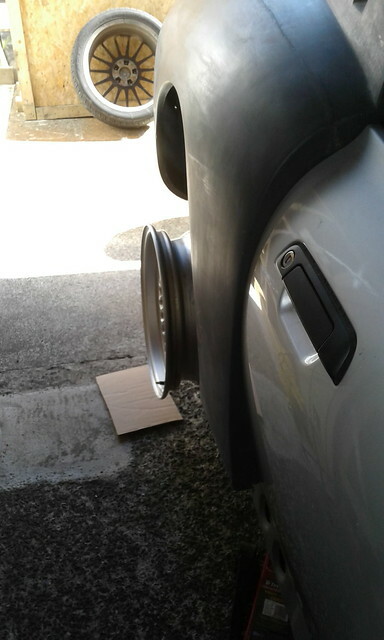 Hi Kidge, yeh sorry in respect to your bumpers/moulds taken from them. I was just made aware that you knew moulds were taken for future use and that they would be supplied with the kit I ordered. As far as royalities, tricky one.....you may have to squeeze a bit for those! 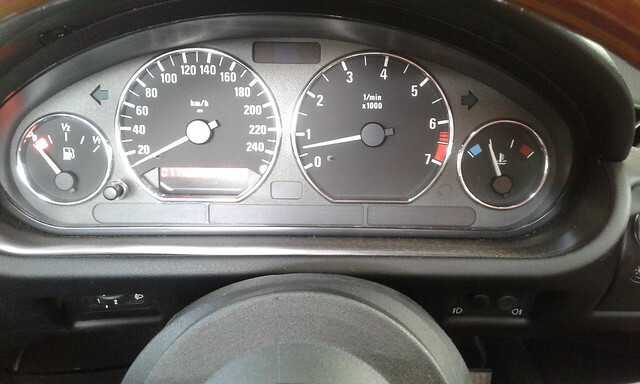 The fwd indicator pods do have a slight sidewards face to them, not directly fwd facing. same as yours? Did you straighten yours? 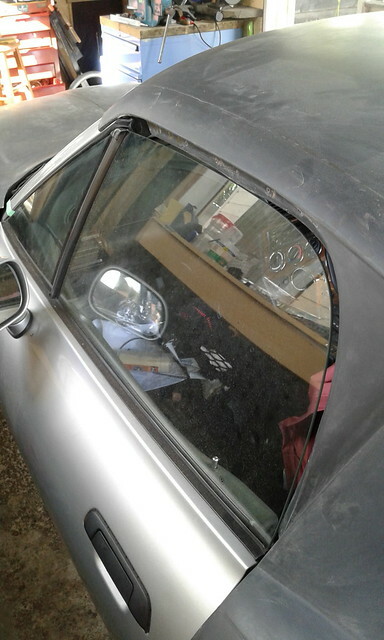 Will be looking further into the bonnet struts to see if a local company can sort an up rated strut for me. Also need to upgrade the springs on the catches when all the lights are in so the bonnet “pops” and allows me a one man operation. Thanks for the good wishes tho, mild progress at best but progress all the same. Hey Welshkiwi, I'm in Auckland too. I hope you are taking advantage of the glorious weather to make progress on your project. Did you ever find boot hinges? They look suspiciously like a pair I have in my garage from a FIAT Dino Sider (also built by Pininfarina). I want mine for my own project but you could easily use them as a pattern to cast and then chrome some for your boot. Superformance used to stock the FIAT items at 75GBP but I see they are out of stock at the moment. Do these look like the boot hinges for a 275 GTB? They do look like the ones you have but at 399 euros they are not cheap. 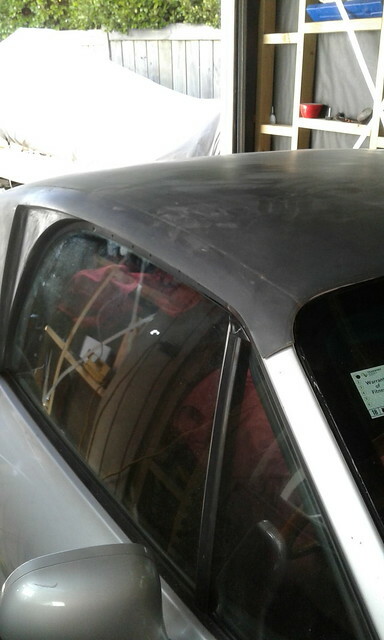 You could always go for internal hinges which some of the original cars had. Have you looked at Morris Oxford boot hinges. Very similar design and readily available new for around £20 a pair. Last edited by Lucky@LeMans; 7th January 2019 at 20:02.. The fiat Dino ones are identical apart maybe from being a bit shorter - easy and affordable to cast them a bit longer in sand then polish then chrome - all depends on how much authenticity you're after. Hey Ross, apologies for the delayed reply, have been away on summer hols etc enjoying our sunshine! Really appreciate the info etc and the offer on the hinge possibilities, will certainly bear that in mind. I am in Howick for your info. I currently have Morris Oxford hinges on the back, not sure whether they will be the finals as they needed a bit of fettling/tidying. The backend is still in the crate and hasn’t seen the light of day yet due to other things taking over so pretty poor progress so far. I have had health issues which means I am heading for surgery in the next few months, my boy has had health issues which has sucked a lot of other time but one day the priorities will change! I have a lot of potential energy just waiting to turn kinetic. Steering wheel and boss ready to fit once tidied the electrical ballast. Seat belts arrived so ready to fit. Have got some 15” style 5 crosslace BMW alloys which I have trial fitted to the car. Could be an option with some 195/65/15 balloon rubber wrapped round them, need the panels fitted before I make final decision on that look. Lots of wiring to run in front clam and rear section still and then going to start bonding for top of screen/front of roof. Look forward to catching up sometime and thanks for the photos of your hinges, they look very similar and very nice! Cheers Mark. Stimulated by Hugh and his steering boss questions I have made some progress - Cheers fella! 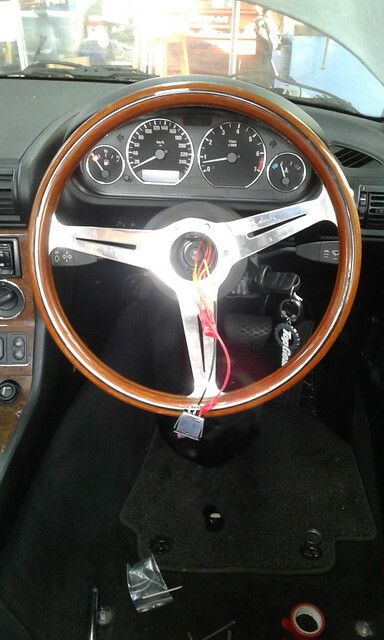 Initial fitment of the Nardi Steering wheel, PCD spacer and OMP boss kit tonight. 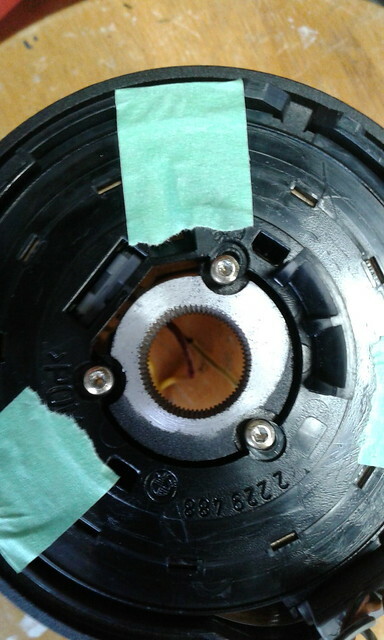 Temporary fit of wheel due to need to change the clock spring fitment to three locations (need to modify the plastic support) and probably need to grind down the OEM original hub spacer washer as it is now too thick and with the face of the column being angled it will be needed to be fitted. Jacked the front up and steering lock and indicator cancelling all works. Even temporary rigged a rocker switch and the horn works ok so I know now the clock spring is good. Managed to complete the fit of the steering wheel today as well as route the rear brake light high level harness, fit the seatbelts (new for LVV cert) as well as 95% complete the rear parcel shelf (some carpet covers to make up for the vertical roll cage supports/belt areas). 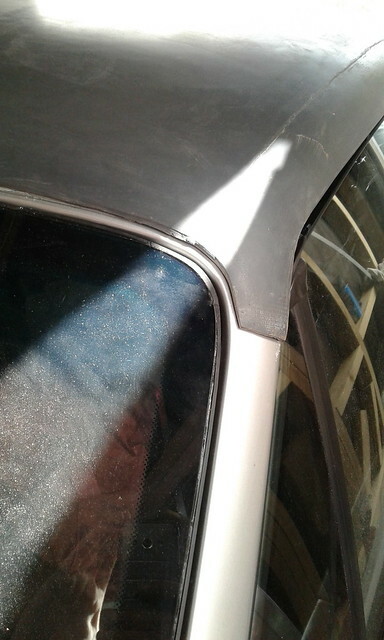 Also prepped the top of the front screen ready for bonding on the support for the front of the roof. 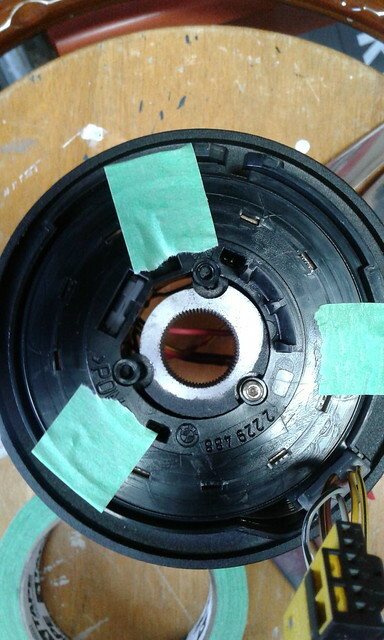 The steering wheel clock spring had to be modified as the holes in the OMP boss were not quite the right PCD and only one hole would align at anyone time. So to fit the three screws I slotted the plastic supports, managed to fit all three screws snug and tight and threadlocked for security. 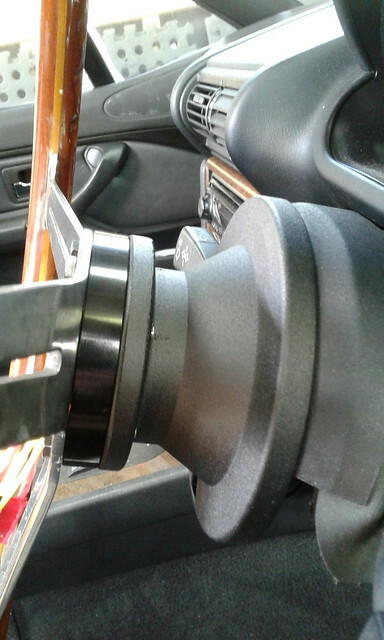 The steering column washer/spacer had to be re-sized, it mic'd up at 10.3mm but to match where the original M series OEM wheel was positioned it needed to be 8.3mm approx. Got the file out and the wet/dry etc and it worked a treat. Just need to fit the horn button now, waiting for my order on E-bay to arrive, gone for a Pininfarina logo button. Managed to trial fit the roof/bodyline tonight. So happy to get to this point! There will be some challenges ahead as I have a few things that I think that may cause a bit of scratchy beard time, but hey what else do we have to do! - Gapping and spacering, body is sitting away from some of its support structures. 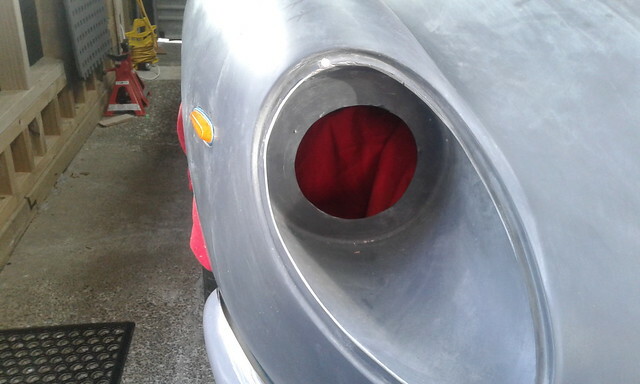 - Fuel filler tubing clearance is not good with the rollcage and boot structure - I may be forced to change shape of the filler tube going through that area or even just fit the filler as a "dummy" and keep the fill original on the side with a fill flap. Hopeful I can sort the former....Here's some pics. But all that said, it is a project after all so where would the challenge be? Looking good so far. What are your plans for the area behind the side windows ? Fill it so it follows the shape of the window ? Hi Lucky, thanks for the comments. No plans as of yet on the window, I spec’d that shape with Chris/Dan as I wanted to see what the relief of the original window shape looked like, especially when all in one final colour. 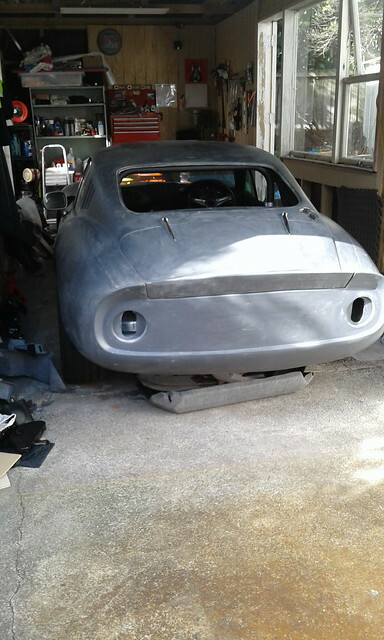 I think at the moment I like it enough to keep, but as I will be running the car round in bare fibreglass for a wee while, I will get enough time to think before making a final call. Cheers.